My friends and I went to see Judas Priest on the ‘Defenders of the Faith’ tour at the Greensboro Coliseum. Although Wikipedia doesn’t have the date listed, I remember that it was in June. It was probably in late June which would coincide with the Charlotte date. Yes, we were excited to see the Priest. But my buddy Jonathan and I were also looking forward to seeing a new band that we liked by the name of Great White. They were listed as the opening band in the newspapers and on the radio commercials. We had Great White’s self-titled debut album and we were always excited to see another band. When we got inside the coliseum, they used to have the merchandise tables out in the lobby instead of the concourse area. So Jonathan and I stepped up for a Defenders tour shirt and I wanted to add a Great White to my collection. Back then, I would even buy a t-shirt from the opening acts that I liked. Hell, I even purchased a Bon Jovi shirt when they were on the 7800* tour opening for Billy Squier. It sounded like one of those generic names of a local cover band. I had more money in my pocket than most 15 year olds because I had been painting with my father so I blindly purchased a Kick Axe t-shirt. I still have it packed away somewhere. Once inside the coliseum we did our usual ritual of trying to spot the microphones for live recordings and admiring all the ladies that were there to put on their own shows. Then we got to our seat just as the lights were going down. The stage was bathed in a dark blue light and we saw this HUGE guy with a mound of hair sit in behind the drum kit. He was joined onstage by a tall guitarist, an average height guitarist, and a smaller than average bass player. There was a low register hum in the air along with screams and the sound of human wildlife in the mix. The guitarists just stood motionless on the stage as the drummer came to life in the darkness. He pounded those drums as if he was warning villagers of invaders. The lights were flashing on only him as he rolled from the snare to the floor toms and back again. Then as they guitars ferociously joined in, the lead singer swung in from out of the darkness on a rope. He was screaming as if someone was pulling one of his fingernails out slowly. The band was loud with riffs that spoke to every fiber of my dark little heart. The singer was wearing a leopard print spandex body suit with bare feet. He must have done this a million times because he landed effortlessly on the stage. The singer went from a full-on, out-of-the-darkness swing to stepping onto the stage as if he was stepping off an escalator. And at the moment that he landed he sang out, “Rock and roll soldiers, side by side, how many times have they made us cry?” And then the rest of the band stepped up to their microphones and yelled back at the singer. I must have been standing there with my mouth open and jaw hanging on the hinges. I was blown away by this band in one minute. They had me. Kick Axe were tight. Their harmonies were dead on. Although I knew nothing about their songs, I enjoyed the hell out of those guys. And even though they only had a 45 minute set, they made an impression that still remains in me for over 30 years. 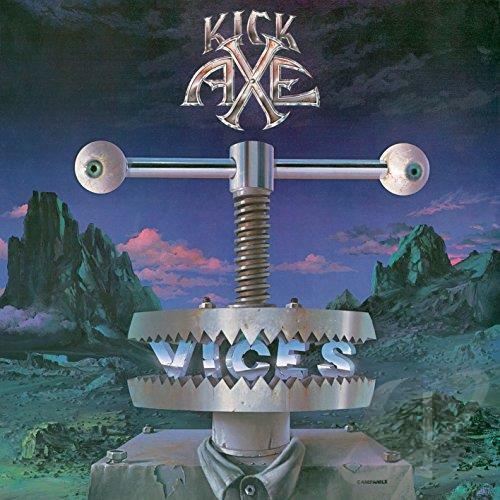 And I’m proud to say that I became a life long fan of Kick Axe on that night in June of 1984. The day after that show, Jonathan and I went to the Record Bar at Friendly Center to get some Kick Axe. Jonathan purchased the cassette and I got a copy of the vinyl. I still have the LP and have purchased a cassette copy with a compact disc copy of ‘Vices’ along my way in life. And if you include the MP3s, I have it on all formats. ‘Vices’ was produced by Spencer Proffer who possessed the Midas touch with Quiet Riot. Proffer had signed them to his own label Pasha that was distributed by Columbia/CBS/Sony. The album starts off like that show in June with “Heavy Metal Shuffle” and for me never slows down. Make sure to put on the headphones or put in the ear buds because ‘Vices’ is a headphones album through and through. The production is crisp and the overdubbing is kept to a minimum. Proffer is a producer that isn’t afraid of leaving blank canvas to fill in the holes. The album kicks off just like the concert that I witnessed with “Heavy Metal Shuffle”. It’s one of those “cheerleading” kinda of songs. Then the title track “Vices” shows off their songwriting chops. It starts with the drums and then a guitar comes in followed by the rest of the instruments. And for most of the song all of the stringed instruments are playing what sounds like three different songs until it’s needed for them to become one. The music is as layered as the lush vocals on the album. It’s one of my all time favorite songs just because it’s, in my opinion, great song composition. “Dreamin’ About You” is the obligatory ballad that mixes in from “Stay On Top” which features the vocalist scatting that would make the Velvet Fog Mel Torme proud. The drums fade from “Stay On Top” while an acoustic guitar slowly rises from the big huge Bonham-like sound. It’s a thing of odd beauty. “Alive & Kickin’” holds a special memory for me and my bud Jeff Baker. His younger brother Mark misheard the lyrics and sang them as “a live, live chicken”. There’s not a listen that goes by without me thinking about that. Personally, there’s not a bad song on the album. If you’re looking for the kind of substance that’s usually debated over snobbish dinner parties, go somewhere else. But if you’re looking for well-crafted hard rock that’s filled with hooks, melody, great vocals, and face melting guitars that will cause your fingers to twitch for more volume… Then you’ve found it. I could teach a community college class on this album. As great as I find it, I feel that is sorely overlooked. After ‘Vices’ they released ‘Welcome To The Club’ that didn’t quite have the same magic. Then they dropped a member and released ‘Rock The World’ on an independent label. ‘Rock The World’ features a great cover of Fleetwood Mac’s “The Chain”. So check that out sometime. They wrote songs for other hard rockers during the 80’s and they contributed to the animated Transformers movie soundtrack as Spectre General. So yeah, they had problems with coming up with a solid band name. ‘Vices’ will always be a go-to album if I need my mood picked up. Not only was it my soundtrack to the summer of 1984, it has been the model that I use for hard rock album comparisons. I think Proffer and Kick Axe set the bar with that highly underrated album. There’s only one album that comes within 99% or reaching that bar. And you’ll read about that album later as we move through my top 50. Read Tim's take here on Useless Things Need Love Too along with Jon Lowder's. Dammit! I'll have to listen again because I didn't get that at all. Could be the mp3 format...?